Migraine. It’s Not Just a Headache. 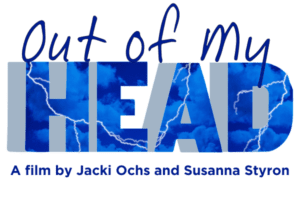 In February 2018 Out of My Head, premiered for a weeklong run at the Museum of Modern Art in New York City. This was the beginning of an ongoing journey to utilize this film to inform and educate the worldwide public about a deeply misunderstood and stigmatizing neurological disease which is commonly characterized by excruciating head pain but is actually a multitude of complex and often bizarre symptoms. The backbone of our film is the journey taken by director Susanna Styron and her daughter, Emma, who, as a teenager, becomes afflicted with migraine. As we accompany them on their quest for understanding and ever-elusive treatment, we hear from doctors, neuroscientists, and others who suffer with migraine. This mother/daughter journey takes us on a wild ride through migraine’s fascinating history, amid subjects ranging from chronic pain to the gut/brain connection to art and spirituality. The primary vehicle we chose for visualizing migraine was an extraordinary collection of artworks created by people who suffer from the disease. The visions expressed by these patients — from Rube Goldberg-like machines of torture to exploding kaleidoscopic television sets — dynamically portray the pain and suffering they cannot verbalize. Their stories present anecdotal evidence that, for many, grappling with the fear of oncoming pain and trying to ‘accept’ rather than resist what is happening can reduce perception of pain intensity. We further learn that with the chronic pain of migraine, there is often a limit to what traditional medicine can provide; and that a holistic approach to monitoring one’s lifestyle and habits with attention to stress reduction and physical health are potentially quite beneficial. Migraine remains a mystery to medical science. Out of My Head makes clear that only with additional research can the mechanism of the disease be fully understood, thereby increasing the potential for finding a cure. What we do recognize now is the far-reaching impact of migraine. In addition to telling a fascinating story, our film illuminates a terribly misunderstood illness, building much-needed empathy for those who live with this crippling disease which afflicts over a billion people worldwide.